WASHINGTON (AP) — Some officers and service members say they are uncertain how to react while the law banning gays from serving openly in the military is in limbo. The Pentagon said Wednesday it had not issued written guidance on a judge's order throwing out the ban, and commanders in the field said they did not know how to proceed on sensitive questions like pursuing existing investigations against gay service members. The Obama administration is considering whether to appeal the judge's ruling, issued Tuesday in California. 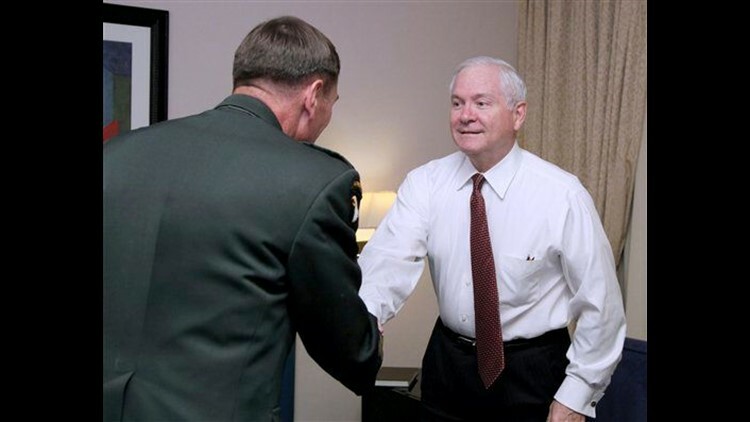 Defense Secretary Robert Gates warned of "enormous consequences" for troops if the court order is allowed to stand, saying the decision on repeal of the law known as "don't ask, don't tell" should be decided by Congress and not the courts. He has said he wants more time to prepare for a circumstance in which, for the first time, gay members of the military could declare their sexual orientation without fear of dismissal. The Justice Department worked into the night Wednesday on its response to the judge's ruling but gave no indication when there would be an announcement. Its first move may be to seek a stay, or temporary freeze, of the order. If that request is rejected, the department probably would turn to the federal appeals court in California. If the government does appeal, it would put the Obama administration in the position of continuing to defend a law it opposes. White House press secretary Robert Gibbs said time is running out for the ban on gays serving openly. "This is a policy that is going to end," he said. On Wednesday, Gates told reporters traveling with him in Europe that repeal of the "don't ask, don't tell" law should be considered only after the Pentagon completes a study of the impact of lifting the ban, including an assessment of service members' attitudes toward the change. The study is due Dec. 1. Allowing gays to serve openly "is an action that requires careful preparation and a lot of training," Gates said. "It has enormous consequences for our troops." In Tuesday's ruling, U.S. District Judge Virginia Phillips in Riverside, Calif., ordered the military "immediately to suspend and discontinue any investigation" or other proceeding to dismiss gay service members. The 1993 "don't ask, don't tell" law says gays may serve in the military but only if they keep secret their sexual orientation. Phillips wrote that the law "infringes the fundamental rights" of current and prospective service members. Gay rights advocates cautioned gay service members to avoid revealing their sexuality for fear that the Phillips ruling could be tossed out on appeal and they would be left open to being discharged. Defense Department officials would not say what was happening to current discharge cases, or even confirm how many pending cases there might be. A Pentagon spokesman, Col. David Lapan, said no written guidance had been issued to commanders on how to deal with the court order. An Air Force officer and co-founder of a gay service member support group called OutServe said he will continue using a pseudonym out of concern that he still could be discharged. "Can I come out right now and be OK? And if I made a statement would it be held against me?" asked the officer, who calls himself JD Smith and said he is an Air Force Academy graduate. He said service members are hoping the Pentagon will clarify the meaning of the court ruling. Warren Arbury of Savannah, Ga., said he'd love to re-enlist in the Army two years after being discharged in the middle of a tour in Iraq. But he's being cautious and patient. "I think it's still way too soon," said 28-year-old Arbury, now a university student. "If I was to hear news that automatically everything would be reinstated, I'd be the first one in the door." The uncertainty extended overseas. When asked by a reporter whether the ruling had had any impact, a two-star U.S. Army commander in eastern Afghanistan suggested he was unsure anything would change and said it was unlikely that his soldiers even knew about the court order. "If that law is changed, they'll abide by the law," but "that's probably the farthest thing from their mind" as they fight, said Maj. Gen. John Campbell, commander of the 101st Airborne Division. Gates, who supports lifting the ban once the Pentagon puts in place a plan for minimizing disruptions, said that besides developing new training for troops, regulations will have to be revised. Gates and Adm. Mike Mullen, chairman of the Joint Chiefs of Staff, face disagreement by some senior general officers on whether lifting the ban would cause serious disruption at a time when troops are fighting in Afghanistan and winding down a long war in Iraq. Associated Press writers Pete Yost in Washington, Anne Gearan in Brussels, Brian Witte in Annapolis, Md., and Russ Bynum in Savannah, Ga., contributed to this report.